Sacred bark at Edfu temple. Edfu temple of Horus main pylon. Sun wings over entrance to Mammisi. God Beth decorating the columns of Mammisi. Wall relief inside the temple. 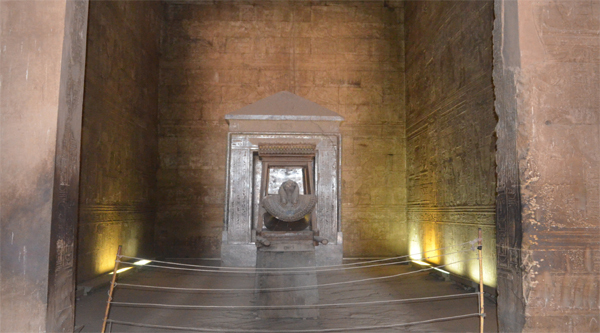 Inside Horus temple at Edfu. Edfu is situated between Esna and Aswan and is a site with long-standing tradition. Its name is derived from the ancient Edbo "The town of the Piercing" and refers to the triumph of Horus over Set. Edfu gained a great popularity when the festal journey between Horus of Edfu and Hathor of Dendera was instituted as a regular ceremony in the New Kingdom. We owe the condition of Edfu mainly to the energy of Mariette, who found it in 1860 in a most deplorable condition: the modern village had invaded the temple, its terraces being covered over with dwellings, stables and storehouses of every kind. In the interior the chambers were filled with rubbish almost to the ceiling. The Temple at Edfu is entirely Ptolemaic, texts on the outer face of the girdle wall indicate that it was begun in 237 BC and completed in 57 BC. The temple contains some of the finest art and architecture of the Ptolemaic period. It is dedicated to Horus, Hathor and their son, "Horus the younger" or "Uniter of the Two Lands". The entire temple ? corridors, halls, ante-chambers, sanctuary, inner chambers, outer walls are embellished with wonderful reliefs. This is one of the most beautiful, and certainly the best preserved of Egypt's monuments. In fact there is no ancient monuments in the world that can match it. A large granite statue of Horus the Hawk (one of two found outside the western tower) stands in front of the entrance guarding the temple. On its head is the Double crown of Upper & Lower Egypt. The temple consists of the Entrance Pylon which is completely covered with inscriptions and reliefs both inside and outside. The Great Court, where offerings were once made to Horus on a great altar, is a spacious enclosure surrounded on three sides by a gallery, supported by thirty-two columns. 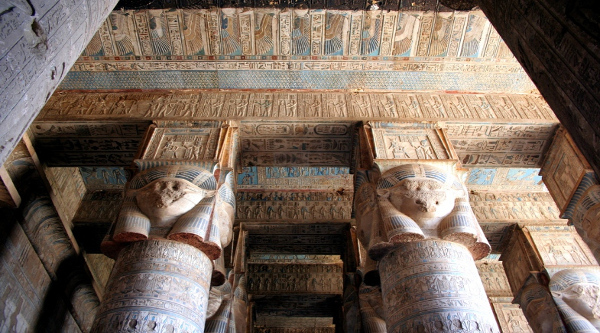 The Hypostyle Hall consists of 12 columns in three rows. They are slender and also have decorative capitals. At the rear of the temple we find two ante-chambers and the Sanctuary where the sacred barge of Horus stood on a low altar. The outer corridor of the temple has reliefs relating to the overcoming of evil (represented by either a crocodile or a hippopotamus) by good, represented by Horus. The outside of the Temple is also embellished with reliefs. 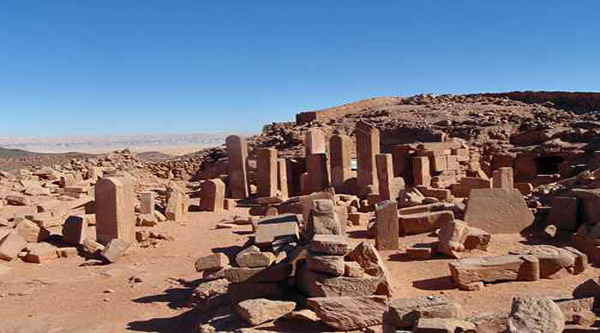 Near the southwest corner of the temple stand the ruins of the Birth House, or Marnmisi. The building was the work of Ptolemy VII, Eurgetes II, and Ptolemy VIII, Soter II. It had a sanctuary surrounded by a colonnade with foliage-capitaled columns, and abacuses adorned with grotesque figures of Bes, god of birth and joy. His frightening appearance was to dispel evil and to protect women in labour. The forecourt was enclosed by columns with stone screens between them. The purpose of the birth house was the glorification of maternal love and joy. The infant Horus is seen being suckled by the goddess Hathor, and the seven Hathors are shown nursing the infant. On the pillars of the colonnade and the forecourt, Hathor beats a tambourine, plays the harp, or suckles Horus.